Now these are just a little bit of heaven. 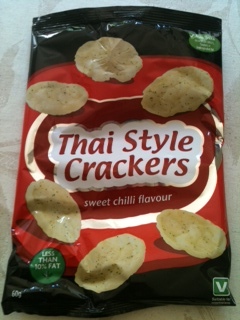 Quite spicy and like prawn crackers without the ickiness for me. Although I absolutely love prawn cocktail flavoured Walkers crisps, I am not a fan of any brand prawn crackers. They just seem too fishy for me. I know, I know, I can hear you all laugh as me saying prawns taste a bit fishy to me. These Sweet Chilli crackers are really spicy, and I am someone who is not usually into things that are too hot, and I do need a drink of water or juice beside me to eat these, but I really did enjoy them. The best bit for me has to be that it is quite a big bag of crackers, and at 60g, it’s not too shoddy an amount to sit and actually eat. Calories 82 – so that makes it a reasonable 246 calories for the WHOLE bag. As a crisp addict, these are just perfect for me. Mmmmmm, these look good, but I won’t be having anymore treats until next weekend. Ooh, they are lovely, really lovely.